American singer and actress Miley Cyrus enjoyed some downtime in Cape Town recently. Miley Cyrus visited South Africa and was spotted in and around Cape Town. The singer, who appears to have touched down in the 'Mother City' earlier this month, managed to go unnoticed until she was pictured sightseeing and doing some shopping. One of her first stops during her low-key visits was the V&A Waterfront. Davis Ndungu, owner of the Recycled Flips Flops store in the area, couldn't believe his eyes when the 'Malibu' singer stepped through his doors. Miley bought his giraffe and dolphin sculptures to take home with her to the USA. "Miley Cyrus was very gracious,” he wrote on Instagram. The 25-year-old also visited PRESENTspace.Staff snapped a selfie with the former Disney star. 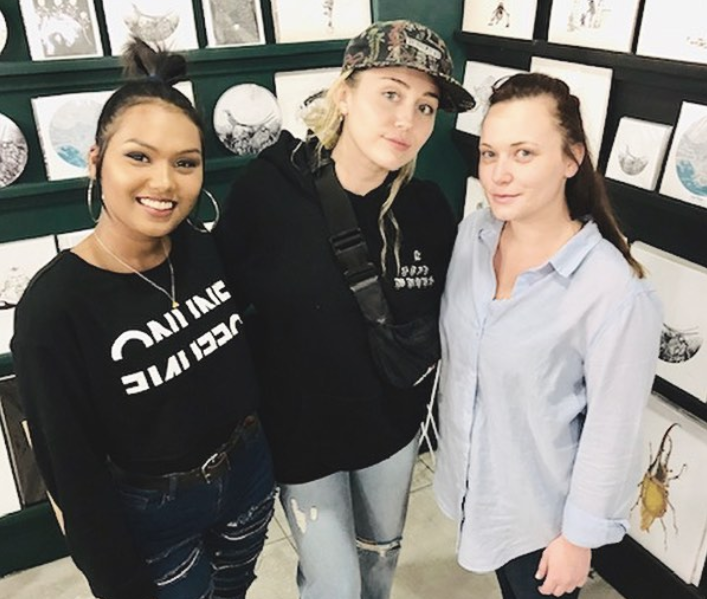 "Miley Cyrus popping into PRESENTspace today, what an insanely nice person!!" the store captioned a picture posted on its Instagram page. It's unclear if Miley has left SA yet but judging by this picture posted by tourist Paulo Santo, she was at the Two Oceans Aquarium on Thursday. We tried to stalk Miley's social media pages for more info, but the star deleted all her Instagram pictures in July and has been keeping a low-profile since then. Her visit seems more like a vacation than a work trip. Her fiancé Liam Hemsworth was nowhere to be seen, and none of the Miley spotters mentioned him. Maybe she is doing some reflection in the motherland? The energy in Africa is amazing after all, well, according to Kanye West anyway. ALSO READ: Is this proof Kelly Khumalo and Chad da Don are dating?